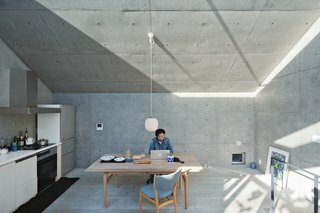 In Tokyo, Japan, where the houses are crammed cheek by jowl, two old friends from architecture school have created a 793-square-foot home out of canted concrete boxes. Tamotsu Nakada needn’t do much to reach his neighbors: He can simply extend his arm and touch two of their houses, each of which is a mere foot from his property line, from his small terrace. "Having more light and air was important to me," says Nakada. But when Tokyo houses are packed in like commuters during rush hour, you need a smarter brand of density.